Blizzard has announced the next co-op commander coming to StarCraft 2: everyone’s favourite cigar-mucher, Tychus Findlay. A key character from the Wings of Liberty campaign, Tychus finds himself back on the battlefield as part of StarCraft 2’s most interesting co-op faction to date. Forget buildings and hundreds of units; Tychus is all about small-scale hero combat. That means when playing as Tychus you’ll be controlling five units in total: no more, no less. The design takes direct inspiration from Blizzard’s work on the main StarCraft 2 campaign, which features several missions that play closer to an ARPG than they do an RTS. As in those missions, each one of Tychus’ squad members will feature their own powerful abilities that more than make up for their lack of battle brothers and sisters. The eight options are all hero-specific recreations of classic Terran units. There’s a Reaper, Warhound, Firebat, HERC, Marauder, Ghost, Spectre, and medic, and you need to lock in the four you take at the start of a match. These elements promise a co-op commander that will really shake up how you interact with StarCraft 2’s objectives, as well as offer a very different way to play the typically unit-dense RTS. 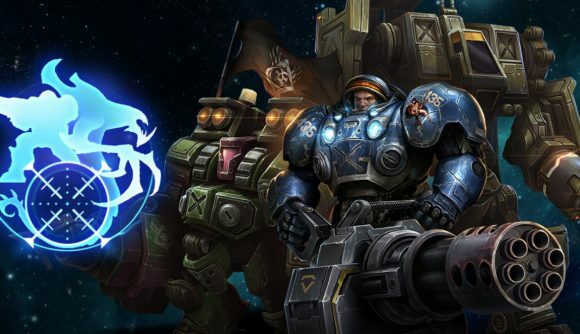 “A lot of the decision making surrounding Tychus is which of the very specialised outlaws you recruit, which gear you upgrade, and the order in which you get all of this in,” Dong says.